If you have varicose veins and are considering endovenous ablation it is Important to know that the benefits, besides cosmetic, include reduced or eliminated leg pain, fatigue, and achiness as well as healing of ulcerations and other skin changes. RFA uses radio frequency bursts of energy to treat patients with venous reflux disease. The technology translates into less pain and bruising than many alternative therapies. Most patients are ready to resume normal activity almost immediately. Patients receive a local anesthetic to numb the area of treatment. 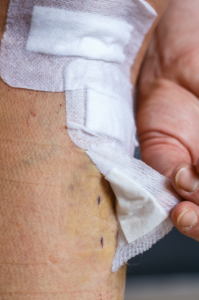 A small catheter tube is used by insertion to reach the affected area of damaged vein. Bursts of radio frequency energy are used to heat the vein wall which forces its closure. This results in both the blood flow being redirected to healthier veins and painful symptoms like varicose veins, leg pain, swelling, fatigue, and even ulceration can be eradicated or at the very least, severely reduced. After your procedure, Dr. Zuzga will have you wear a compression stocking for a couple of weeks. He will also give you an exercise regimen to follow to strengthen legs and veins. Minor bruising may be experienced in some. When compared to traditional vein stripping and other surgical options it is very minimal. While results vary from patient to patient our patients have reported being very happy and satisfied with the results. Dr. Zuzga is very thorough and sets a plan for every patient individually in order to see the best results possible. Taking before and after photos is ideal so you can visually see your results. If you are in the Safety Harbor or Tampa, Florida area and in need of a Vein Specialist we hope you consider The West Florida Vein Center. www.westfloridaveincenter.com (727) 712-3233.